Merry Christmas! We have been truly blessed with the cards right now. Our little monster from my friend, Joanna Nelson, reminds me of the timeless 1985 classic, ‘We are the World’, by U.S.A. for Africa. 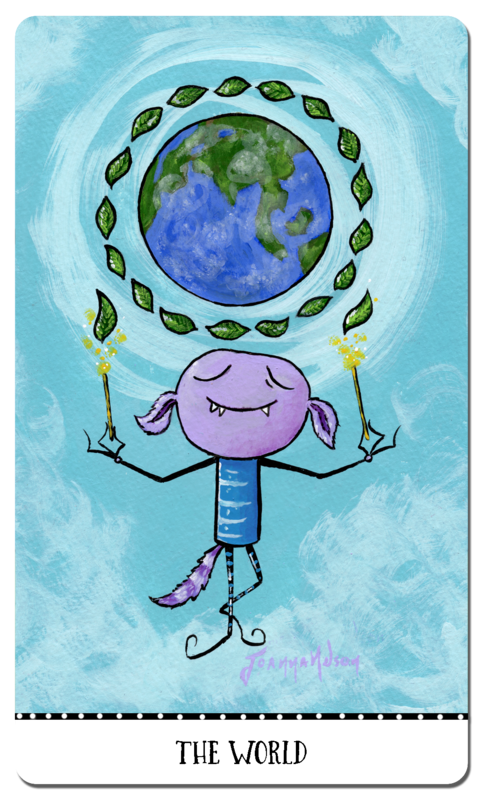 The World card itself can mean many things, but for today, let it be all voices coming together in harmony, bringing peace and joy to the world. The doors are getting ready to open! Whether you are celebrating a holiday today, or not, embrace the positives and enjoy your day. Happy holidays to all! This entry was posted in Card of the Day, General Tarot, Love and Finance, Patreon, Readings, YouTube Videos and tagged Card of the Day, Guidance, Path, Reading, Tarot.